The last time I saw Sho Madjozi, we were in a large studio space where she was shooting a special for a popular brand she endorses. She swaggered in and, like a magnet, she drew everyone’s attention. Wearing grey sweatpants, a Sotho-inspired Butan Mountain Panther sweater and a pair of Air Max 1 Atmos Safari, it was clear that the clothes didn’t make her. All of that was mere enhancement on the natural cool of the 26-year-old artist born Maya Wegerif. An aesthetic that resonates to the point of people across the nation flocking to salons to have their hair braided like hers. So it was not much of a surprise that Sho Madjozi is given the Most Innovative Style award at the 22nd annual SA Style Awards. Sho Madjozi, who has performed at Global Citizen and Afropunk New York, entered the entertainment realm as a poet but it was when she reinvented herself as a rapper that she took the world by storm. She believes the title of Innovative Style is befitting beyond fashion. 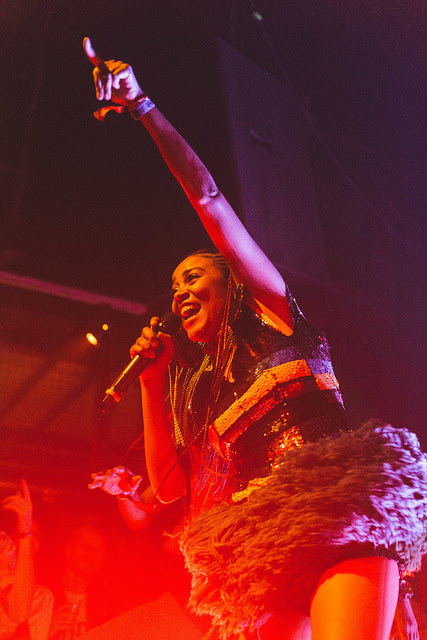 Most recently, Sho Madjozi has appeared alongside Sjava and Lady Zamar on Ganja Beatz’s Night and Day. There, she raps about someone who loves umswenko. “The idea of that song was supposed to be alter egos. I’m a village girl and my parents are very humble. My parents were about doing community development and humanitarian work, never about material things. But now, I’m balling. So it’s like my upbringing is pulling me in one direction but at the same time, now I am experiencing nice things and I like it,” she laughs. In her lyrics, Sho Madjozi name drops Comme de Garcons as well as Carvela – foreign brands that represent very different classes in South Africa. She wears Moschino on magazine covers and recently collaborated with Edgars to release a clothing line that will include Xibelani (referring to traditional dance and the skirts the dance is performed in) for kids and other apparel for adults. It’s through the commissioned song heard on the Edgars ad that Sho Madjozi makes her stance on blurring the line that separates classes, ages and tradition. She defiantly says: Don’t Tell Me What To Do.